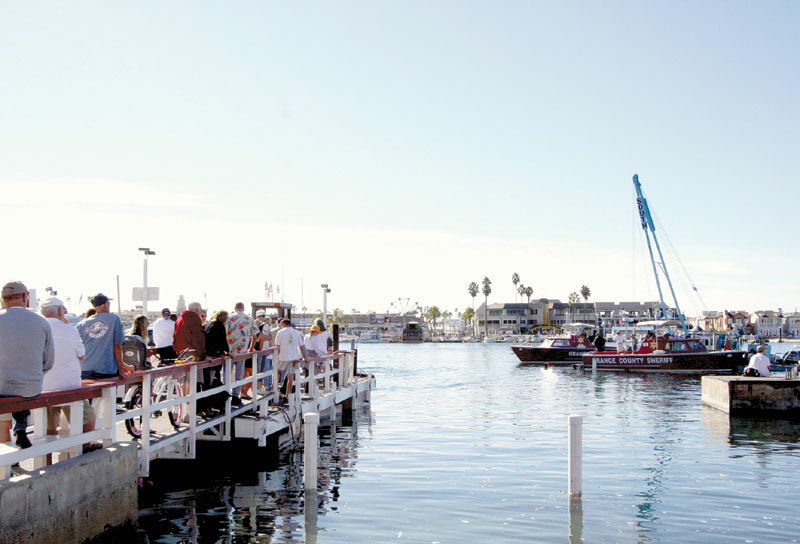 NEWPORT BEACH — Friday the 13th didn’t start off very well for a family on vacation in Newport Harbor, as their minivan ride aboard the famous Balboa Island Ferry turned into more of an on-the-water experience than they had anticipated. The family of four had just arrived in California from Taiwan a day earlier. They were planning to take the ferry from Balboa Island to the peninsula, and later head out aboard a whale-watching charter boat. But at around 9 a.m., as they lurched forward in their rented minivan — the first car to board the three-car ferry — a black Mercedes-Benz immediately behind the vehicle collided with them, causing the car to unhinge the safety gate and plunge into the water. Dave Beek, owner of Island Marine Fuel adjacent to the ferry, watched the scene unfold. Newport Beach Fire Department spokeswoman Jennifer Schulz said the family rolled down the windows of the van and climbed aboard the boat. The father, wife and two children in the car — one of whom was in a car seat — were reportedly not injured during the incident. “All of the stars aligned for this: The car floated, and the people were OK,” Beek said. Back on the ferry, the Mercedes teetered precariously at the edge of the deck, nearly falling into the water, as well. The woman driving the car was pulled to safety — however, she declined to comment for this article. According to reports at the scene, the woman was a ferry boat regular on her daily commute to work when she accidentally pushed the accelerator instead of the brake upon rolling onto the ferry. While no injuries were reported in the incident, the only casualty appeared to be the minivan, which ended up at the bottom of the harbor in about 15 to 20 feet of water. “That family came down to Balboa Island to take the ferry across to go whale watching, and they ended up floating in their van down Newport Harbor,” Beek said. The rescue and cleanup was a joint effort between the Newport Beach Police Department and Newport Beach Fire Department on the landside, and the Orange County Sheriff’s Harbor Patrol handling the in-water operations. South Mooring Co. was called upon to assist the Harbor Patrol in pulling out the boat — a process that took about five hours. A dive team was called in to assess the situation and rigged the minivan so that a crane could pick it up. The van had flipped over upon sinking. “They rigged it so that when we picked it, it basically rolled over and came up pretty easily,” said South Mooring Co. owner Chuck South. After it was raised, South said the crane placed the minivan on the deck of one of the ferry boats, and Newport Beach police officers towed the vessel away. The crane also moved the Mercedes from the edge of the ferry, before it needed to be towed away, as well. After the incident, the family was escorted by Newport Beach police officers to get another rental car, so the tourists could get on with the next leg of their California adventure: a trip to San Diego.